s expected first half ends with breaking of family which is high on emotion which will make family audience burst into tears. Good thing about Srikanth Addala movies is his dialogues, way of his emotional narration with a very strong characters. Second half could have been better. Compared to first half it is a let down. Srikanth Addala should have done a better job with his screenplay. Movie runs on a very slow pace in the second half. 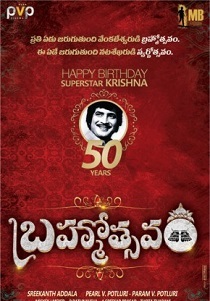 To sumup, Brahmotsavam is not a great attempt of celebration. 'Brahmotsavam' has grand theme and ideas but the director has failed to tell in convincing way as it is laced with tedious sequences, unending songs. Mahesh Babu’s performance, rich production values and absolutely bright camera work have worked out in this movie that has many issues. A huge letdown. Dialogues are lengthy and post-interval become needlessly cryptic. Most of the time Mahesh becomes a beguiling factor in moving the otherwise dragging plot, ahead. His character is not consistent but is never aggressive, despite a small action scene post-interval. The producer has provided all the big character artistes on a platter, Revati suddenly disappears after her husband’s death, and returns in the last scene. On the whole, Brahmotsavam is a film which has some decent moments going its way. This is not your regular dance and fight movie and has simple emotions. Mahesh Babu’s performance, family emotions and huge star cast are basic assets. If you ignore the predictable nature of the storyline and some boring moments during the second half, this is one film which can be easily watched with your family this summer. This is less of Brahmotsavam and more of BoreUtsavam. Mahesh Babu’s earnest performance and stunning visuals are the saving grace in this confusing family drama! Govinda Govinda...Despite director's honest attempts to make us emotionally involved, we would emotionlessly wait for it to end. The best scene of the second half comes during the climax. But it is not strong enough to make us forget all the pain that we have gone through till that point. Celebration is restricted!Brahmotsavam has conveyed a right message but in a wrong format with a poor screen play and direction. Had more effect been put by the makers to make the product a racy one, the result could have been far better. On the whole, there are many films like “Pandanti Kaapuram” and “Samsaram Oka Chadarangam” which tested the theme of family bonds in two different directions of staying together vs. going nuclear. Brahmotsavam starts to rekindle that sentiment but failed to capitalize on the promise. It is barely watchable and might not pick up steam. A lesson for innovative producers like PVP not to get carried away with narratives that promise the moon and deliver half of it. Brahmotsavam is a film which has some decent moments going its way. This is not your regular dance and fight movie and has simple emotions. Mahesh Babu’s performance, family emotions and huge star cast are basic assets. If you ignore the predictable nature of the storyline and some boring moments during the second half, this is one film which can be easily watched with your family this summer. Brahmotsavam turned out to be a disappointment. The major credit of this should go to the director who despite having every thing at his disposal, failed to translate the good point in to a good film. Except for few scenes mainly around the interval and climax, the film is boring especially with those never ending lengthy dialogues. Lets see how it fares at the box office! It becomes a long drawn out yawn at the end. But despite its flaws, the movie definitely is an eye-opener and it has to be watched with family. Mahesh Babu's performance single handedly redeems this film. May not be everyone’s film, but it surely appeals to people who have seen joint family systems that aren't existent lately. Mahesh Babu is the only son of Sathyaraj and Jayasudha.Sathyaraj is a popular rich person in a vilagge where he owns a paint factory.It is a joint family where Rao Ramesh, brother in law of Sathyaraj,his daughter Pranithi also live along with Mahesh Babu’s family.Rao Ramesh,who feels as if he is in the shadow of Sathyaraj plans to grab Sathyaraj property by making his daughter marry Mahesh Babu. Directionless Drama.Brahmotsavam tests the patience with its idiotic scenes, directionless screenplay, and snail-paced romantic thread. If not for Mahesh Babu’s presence, the film collapses completely. Brahmotsavam is a very ambitious film. Wanting to tell so many things that nothing ends up being conveyed properly. You do not understand, for instance, why Mahesh goes on a journey to find his routes. There may be a reason, but it's lost in translation. And many more elements go through the same treatment. Brahmotsavam will give you moments, where you will find yourself relating to at least one principal character in the movie. But, if you are expecting an entertainer with humour and hero elevations, it will bore you to death. A film that drives home the message that relationships must be celebrated. Only that the idea is stretched into a feature film. Draw you conclusions. Slow pace hurts. Is Mahesh is out to impress the family audience? Wait and watch! Brahmotsavam is a disappointing family drama that was beaten to death with Srikanth Addala’s terrible execution.